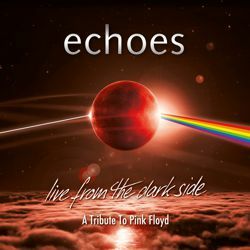 After performing hundreds of concerts throughout Europe, enchanting thousands of people and playing festivals alongside all time greats like Jethro Tull, Joe Cocker, Manfred Mann and Asia, Echoes are now one of the premier Pink Floyd Tribute Bands. To echo the music has never been enough for this band and so the elaborate live shows convey the grandeur in all its facets. The "Süddeutsche Zeitung" simply calls it a spectacle. cascades of electronic noise and intense atmospheric density be reduced to such austerity that the spirit isn’t lost? Or simply put, can you walk barefoot to the dark side of the moon? With the acoustic show "Barefoot To The Moon" Echoes present their answer. The band centered around extraordinary guitarist and singer Oliver Hartmann (Rock Meets Classic, Avantasia) carefully dismantles the complex arrangements of the British art rock giants and uses only elementary and partly very unique Instruments to reduce the songs to their fundamental composition. All the while making sure that none of the magic is lost, but rather focused and so familiar sounds slightly change color and thus far unknown shades emerge. This stripped state shows a fascinatingly fragile beauty, that could not have been perceived before. Echoes reveals the essence of Pink Floyd. The exceptional atmosphere of this acoustic concert reflects not only in the music but also the familiar setting; candles instead of a laser show, a string section instead of keyboard sounds, reduction instead of inflation. Floydian grandeur turns into intimate music experience, borne by creativity, wit, charm and respect for the makers who are Pink Floyd. This DVD, recorded at the sold out Stadttheater Aschaffenburg, impressively documents the memorable evening and manifests the music of Pink Floyd in a way that it has not been heard before.